Some think that a huge prophetic sign of the End is the complete and utter annihilation of the city of Damascus. It is prophesied in the Bible in Isaiah 17. The city is one of the oldest “continuously inhabited cities in the world”, (Wikipedia), but God says to Isaiah that there will come a time when it will “no longer be a city, but will become a heap of ruin”. It will be in a time when the nations are “raging” but “sudden terror” will come upon them because of what they have done to Israel. This is a very serious prophecy. I don’t know 100% that it is a major prophetic sign, but, if you should see Damascus hit by an Israeli nuclear weapon and completely wiped away, take heart and remember Isaiah 17!!!! What awaits Lebanon and the Lebanese if the opposition wins the coming parliamentary elections? The answer came in the form of a “notification” distributed by the head of Hezbollah’s parliamentary bloc to participants in this week’s national dialogue session. In it, the party warns of all-out military maneuvers that Israel will carry out at the end of next month, or a week before the elections, with the participation of all of its agencies, institutions and weapons. In addition, the Lebanese state is supposed to join up completely with the resistance in preparing for the outbreak of a “surprise” war with the Jewish state. In this sense, Hezbollah is portending an inevitable new war with Israel, one whose timing depends on factors connected to both it and the Jewish state. The Lebanese state can take no action except to prepare for this war, since anything else would have no point. After failing to reach agreement with Hamas over the formation of a Palestinian unity government, Palestinian Authority President Mahmoud Abbas is planning to form a new government that would not include representatives of the Islamic movement, a PA official in Ramallah said Thursday. In response, Hamas warned that such a move would be regarded as a “fatal blow” to Egyptian efforts to end the power struggle with Fatah. Nabil Abu Rudaineh, a spokesman for Abbas, said that Abbas was expected to announce a new government soon. He did not give a date, but another PA official said the new government would most probably be established on the eve of Abbas’s visit to Washington, where he is expected to meet for the first time with US President Barack Obama. The defacto Hamas government in Gaza is re-training its army and changing its tactics in preparation for what it believes will be another war with Israel, according to Staretegypage.com. Iran and Hizbullah are advising Hamas on how to overcome its failures against Israel in the IDFs Operation Cast Lead counterterrorist campaign earlier this year. Hamas tactics in the war backfired. It told its fighters to dress in civilian clothes as a ploy to raise civilian casualties, but the IDF surprised it by pinpointing its attacks and warning civilians to leave areas before they were bombed. Hamas has used the ceasefire, which Israel declared on condition that international monitors would be positioned along the Egyptian border to stop smuggling, to bring in advanced weapons through new tunnels that have been built. Two Arab smugglers or workers were killed Thursday morning in a tunnel collapse underneath the border at Rafiah. *The Hamas army now includes anti-aircraft missiles that have been provided by Iran. * Israel Air Force planes were equipped with devices to deflect anti-aircraft missiles during Operation Cast Lead, but the newly-smuggled weapons are more advanced. During the next war, Hamas’s army will remain in uniform and will use hit-and-run tactics instead of directly engaging Israeli troops. Hamas has dismissed 40 commanders of its forces, which it is re-building with more discipline. It also is developing improved communications systems to protect senior leaders, many of whom were targeted by Israel. One tactic that worked to a certain extent was the deployment of its army in schools and hospitals, which also were used as weapons depots, forcing the IDF to delay attacking unless it could be proven beyond a doubt that the facilities no longer were functioning for civilian purposes. NEW YORK — A global children’s rights treaty, ratified by every UN member except the U.S. and Somalia, has so alarmed its American critics that some are pushing to add a parental rights amendment to the Constitution as a buffer against it. The result is a feisty new twist to a long-running saga over the UN Convention on the Rights of the Child. The nearly 20-year-old treaty has ardent supporters and opponents in the U.S., and both sides agree that its chances of ratification — while still uncertain — are better under the Obama administration than at any point in the past. Opponents of the treaty contend it would enable government officials and a Geneva-based UN committee of experts to interfere with parental authority. Its supporters view the treaty as a valuable guidepost for children’s basic rights — including education, health care and protection from abuse. Gardinier says her coalition — with scores of partners including Amnesty International and the Girl Scouts of the USA — has learned to be patient, and hopes an all-out push for ratification will be mounted by the third year of Barack Obama’s presidency. The treaty’s opponents say they will be ready to fight back, and the proposed parental rights amendment is a key part of their strategy. Introduced this spring by Rep. Pete Hoekstra (R-Mich.), the amendment has 80 of his fellow Republicans as co-sponsors in the House. Sen. Jim DeMint (R-S.C.) says he plans to introduce it in the Senate. Hoekstra acknowledges that they are far short of the needed two-thirds support in both chambers of Congress to forward the amendment to the states, but he says the dynamics could change. Israel National News reports: “Five European nations, as well as Turkey, have ignored the economic sanctions imposed by the United Nations Security Council in the past year, according to state-run Iranian media. The head of the Iranian Trade Promotion Agency, Mehdi Ghazanfari, told the IRNA news agency that Germany, Switzerland, Italy, France and the United Kingdom have carried out some $15.4 billion in bilateral trade with Iran over the past year. Ghazanfari said the European states were ‘keen on continuing bilateral economic cooperation with Iran,’ despite the U.N. sanctions. Turkey has gone even farther, according to Bahman Hosseinpour, the Islamic Republic’s Ambassador to Ankara. Hosseinpour told participants at a business seminar focusing on Iran-Turkey ties that trade volume between the two countries has reached a record $12 billion this year alone, according to the Fars news agency. 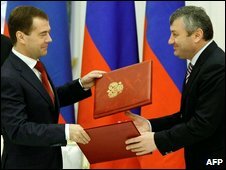 Russia has signed a five-year deal taking formal control of its de facto borders with two breakaway regions of Georgia, South Ossetia and Abkhazia. Nato said Russia was in “clear contravention” of the ceasefire ending last year’s conflict with Georgia. The deal comes ahead of planned Nato exercises in Georgia next week, which Russia’s President Dmitry Medvedev has described as “overt provocation”. Russia and Nato only resumed formal contacts on Wednesday. The two rivals have been gradually rebuilding ties after breaking off contacts over the war. Major developing countries like China are doing far more to address climate change than most Americans realize, the top climate change official at the United Nations said yesterday after a meeting in Washington of ministers from the world’s biggest greenhouse gas emitters. The two-day meeting, requested by President Obama, brought together officials from 16 of the world’s major economic powers—the United States, the European Union, China, and India, among others—for a special, intimate round of negotiations as they work toward signing a new climate change treaty with the rest of the world by the end of the year. There’s a new song out by Jordan Sparks, called “God Loves Ugly”. It is such a gorgeous love song about loving yourself through the love of God and another person’s love for you. It goes to the heart of ugliness. Feeling ugly is beyond the outward appearance. It is being convinced that you are unlovable. But when God showers love upon us, and He showers love from others into our barren lives, we see the beauty reflected. We are beautiful. We become more than ourselves and the outward appearance. We become who we truly are inside, a lovely, lovable, beautiful person. God really does love ugly. But I want to end with this….when Christ came to earth to save us all from this wretched ugly place, He didn’t just waltz in with His shining chiseled face and flashing white teeth. Giving us all a superstar nod.